The Siberian city of Krasnoyarsk came alive in November as it played host to an annual book fair that this year featured American author Ian Frazier. The population of Krasnoyarsk reached the symbolic threshold of 1 million only five years ago. Wooden 19th century buildings with 12-foot gates and carved wooden shutters sit side-by-side in the city’s streets with brightly colored Stalin-era architecture, stadiums, and new high-rise office towers. Only the Yenisey River, sometimes called Batyushka (honored father) by the locals, provides a bit of fresh air. In early November, however, a fresh wind of cultural change arrived in the Siberian city: The seventh annual Krasnoyarsk Book Culture Fair. For many locals, it was the highlight of the year. They visited seminars; they asked questions; they asked for advice. They came with their children to hear tales about Curious George the monkey. They listened to famous poems read aloud; some tried to read their own. And they bought lots and lots of books. The most famous guest of the fair was Ian Frazier, the bestselling American author of “Travels in Siberia,” which he wrote after crisscrossing the vast Russian hinterland both in summer and in winter. Frazier kept insisting that the Siberian people he met during his travels were not nearly as austere and severe as their popular image suggests. "They were very friendly and curious. They were very willing to talk to me,” the American writer said. “Maybe that is because most of the places I visited were small towns, where people had never seen an American before." It turns out that people in other countries know next to nothing about Siberia; they think of it as a very cold place, with lots of prisons. In New York City, “Siberia” is what they call the worst tables at the restaurants. “To talk about all the other fascinating aspects of Siberia I had to get across to break that concept of Siberia that it’s cold and prison," Frazier said. “You should explain what Yenisey is, what Baikal is, and how beautiful these places are.” The author firmly believes that Siberia is the place where Russia truly becomes Russia. He says one of the most fascinating Siberia-related stories is the story of the Decembrists, a group of aristocratic revolutionaries who staged a failed uprising in St Petersburg in December 1825, and were sentenced to forced labor in Siberia. “I visited the Decembrists museum in Irkutsk, and I was so impressed by their tragic fate that I have read everything about the Decembrists. I even read the memoirs of Yakushkin in Russian with a dictionary and it took me about 18 months." The American author was not the only highlight of the fair. The organizers of the event, the Prokhorov Fund, also staged an opening performance that centered on the Printed Word, which has always united different nations all over the world, bringing peace and prosperity. 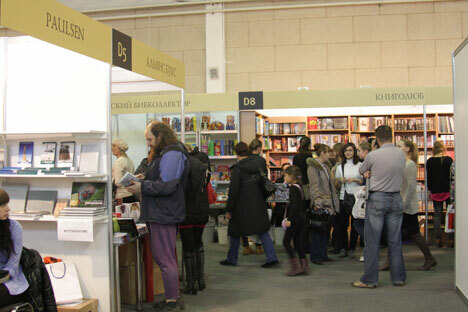 Many of the meetings and presentations at the fair focused on book translation. They included a master class for translators from German into Russian. At the end of it, the participants presented their sample translations of short literary texts. The master class was the opening event of a new transcript program. According to Irina Prokhorova, a cofounder of the Prokhorov Fund, the aim of the program is to popularize Russian literature abroad. Another important part of the fair’s program was translating poetry, which is arguably the most difficult type of translation. A discussion of poetry by Aleksei Parshchikov was attended by two other poets, who translate Parshchikov into English and German: Eugene Ostashevsky from New York City, and Hendrik Jackson from Berlin. They discussed poems by Parshchikov and Jackson read samples of his translations of the Russian poet into German. Another meeting was devoted to the poet Arkadii Dragomoshchenko, who worked in the 1990s with the American poet Lyn Hejinian to establish the first cultural and poetic exchanges between the U.S. and Russian. The Night of the Museums, which was held in cooperation with the Krasnoyarsk Museum Center, had young poets presenting video performances. “Poetry is now interacting with other kinds of art," said the poet Nikita Safonov. “We are trying to demonstrate how multi-faceted and versatile poetry can be, and how its possible translations can vary. We are also trying to preserve the ambiguity originally intended by the authors." Participants of the Krasnoyarsk Book Culture Fair did not seem particularly worried by the predictions that traditional books are disappearing and moving into the digital format. These worries, incidentally, were one of the central topics of discussions at the Moscow International Book Fair. That assertion was amply illustrated by the rapidly emptying bookshelves at the fair, and by the happy visitors leaving the event with armloads of books. The Prokhorov Fund’s representatives said it hoped the fair will encourage the local authorities to facilitate the distribution of books in towns and villages, thereby setting a positive example for other Russian provinces. In the end, it is not really important whether people read printed books or use electronic gadgets to do the same; the important thing is that they keep reading.